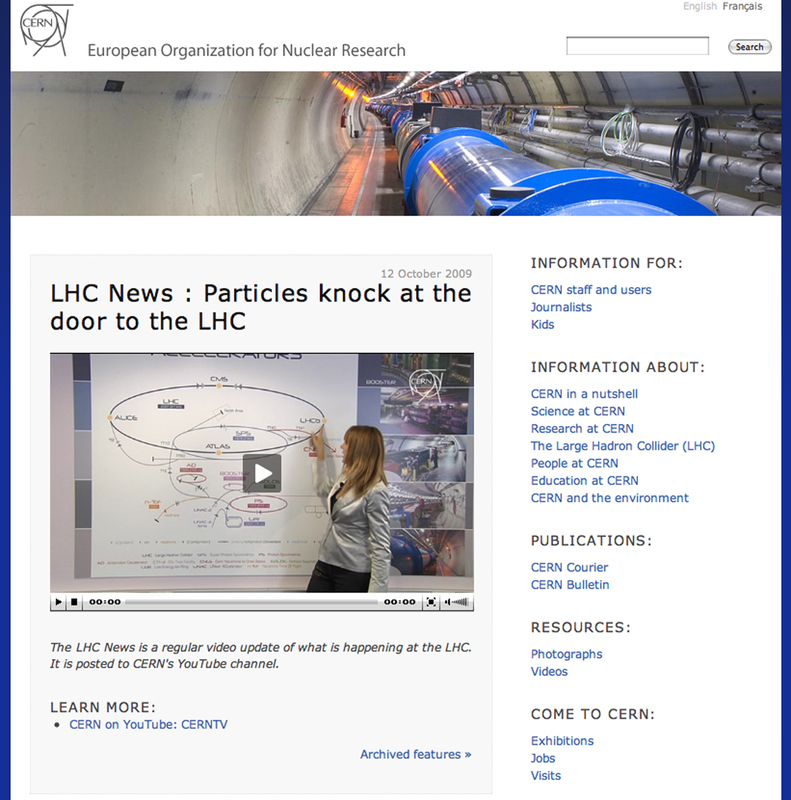 Some of you may have noticed a change of format on the CERN public homepage recently. The Bulletin catches up with Dan Noyes, CERN web content manager, to find out what is happening. With over 7000 websites in the cern.ch domain, CERN’s web landscape is a challenging one to manage. Dan Noyes, who joined CERN a year ago, is the web content manager within the Communication group, which is mandated to develop the public and user websites as well as developing standards and guidelines for the wider CERN web. The recent changes made to the public homepage were the first small step towards some quite major changes proposed for CERN’s websites over the next couple of years. Currently, one of the problems of CERN’s websites is that the quantity and the diversity of the information in them make them difficult to manage, if one wants to avoid duplication and to keep information updated and easy to find. This is also aggravated by the lack of a standard design philosophy and consequently of a coherent architecture. "We have to change that; we have to manage the way that information on our websites is structured, and we have to make information easy to find", says Dan. The recent change to the public homepage was an attempt to provide a clear set of links to key information sources on the CERN web, along with some more dynamic news elements. "We looked at the web usage statistics and made sure that the links that people commonly use are all plainly displayed, easily accessible, and correspond to the search queries that people perform when they come to our websites. This is very much a first step towards bigger changes, but it is not a significant redesign: what you find behind the links on the front page has not changed, nor has the basic layout of the page – this is to follow further down the line. These proposed changes have been outlined in our group’s communication plan, which is currently in the approval process." To make access to key information easier, there are new links for some key audience types: users, journalists and children. Dedicated websites for these audiences were already accessible from the old homepage but the links were not as prominent. "In the long term we plan to consolidate a lot of our websites into a single one. For example, information posted on the public website is often relevant to users and vice-versa; the same is true for journalists and the public," says Dan. One thing that might have surprised a lot of people at CERN is the presence of a feature box followed by some tweets. "The feature box on the public homepage is a way of focusing on a single issue and providing links to the various places that can give more information on it. The feature will change at least once a week – the old homepage had a tendency to become a little stale at times," explains Dan. As for Twitter, the Communication group started using the service some time ago. "We have over 14 000 followers. Bringing our Twitter feed into the public homepage does several things. Firstly, it advertises the fact that we have one; and whether or not people choose to use Twitter they can see what CERN is saying on it: this is not a closed social network, but a lightweight tool to reach many people. Secondly, until we do have a www.cern.ch/news/ that acts as home for all news and current interest content for CERN, Twitter can fill the gap in many respects. It also provides an RSS feed: people can keep up to date with what is happening at CERN easily." The use of Twitter marks a start for the Communication group of a move towards the adoption of web 2.0 tools. "These tools are especially useful in an environment such as CERN because we need to communicate with huge numbers of people, and at the same time we want to learn what people think about CERN and its research," says James Gillies, head of the Communication group. Are there changes planned for the users’ pages? "Yes," anticipates Dan. "The public and users’ websites will be aligned in terms of design and approach and eventually merged into a single site. The first ‘alignment’ phase will basically be a re-design of the current users’ site which will be run in parallel with the existing one and feedback will be sought, before it eventually goes live and replaces the old grey pages we are all so used to. The second phase, where public and users’ pages are merged, will require the use of a content management system for our central websites so that we can ‘push’ chosen information to the relevant audiences." With public interest in the LHC growing in the lead-up to the LHC re-start, these improvements in usability and navigability to the public homepage are timely, and certainly appreciated.